Last week I wrote about the summer flying dilemma, the challenge of balancing passenger comfort, speed, and the rising summer cumulus clouds. Pilots face a whole series of dilemmas like that with every flight — in fact, it’s probably fair to say that flying is more about finding balanced solutions to different dilemmas than it is managing the yoke, rudder, and throttle. This week, I had to deal with a different challenge, the fuel and weight dilemma. 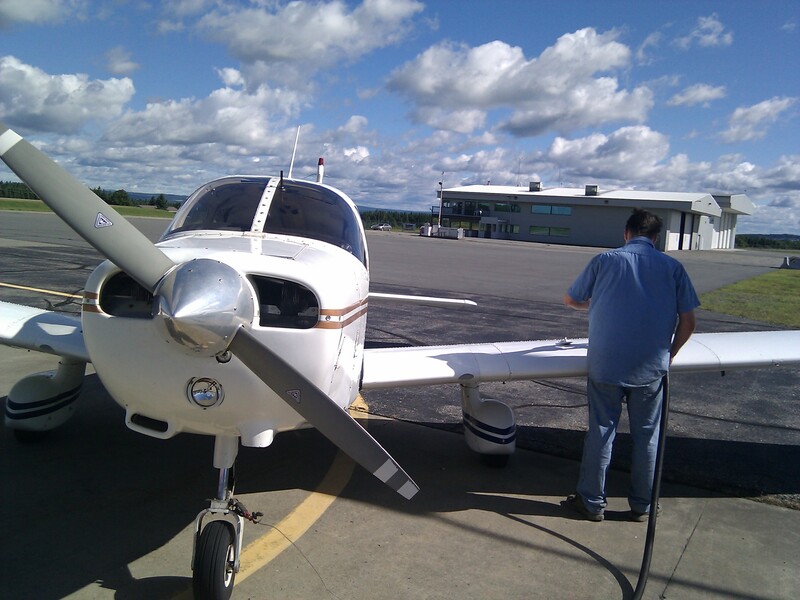 A few years ago, I never had to worry about this one: my Piper Warrior can carry 665 lb when the fuel tanks are full, and that was enough for my whole family of four, our dog, and luggage, so filling the tanks for every flight was a no-brainer. Now my girls have grown into intelligent and beautiful women, and I’ve gone the other direction by putting on a few extra pounds, so I have to start thinking about fuel and weight. 48 gal 5:35 665 lb Family and nothing else. Three of us and 150 lb luggage. Me and 455 lb luggage. There is some stuff I have to carry in the plane — charts, Pilot Operating Handbook, tow bar, a couple of quarts of oil, some emergency supplies, cover, etc. That stuff weighs at least 20 lb even when I strip it to its bare minimum, so out of a 40 lb baggage load, only 20 lb would be available for bags — that’s 5 lb each for four people. People rarely fly naked (which is a good thing, given the average pilot’s age). Even in the summer, clothes and shoes add an extra 5 lb per person, and people tend to carry purses or backpacks with food, books to read, etc., adding an extra 5 lb each. For safety, you need to have a fuel reserve. The minimum required is 30 minutes (45 minutes at night) VFR, and more, including fuel to get to an alternate airport, IFR. For me, 2:40 fuel means at most a 1:40 flight VFR, and maybe 1:00 IFR, which isn’t enough to be useful for cross-country flying (a fuel stop every hour makes for a long flight). There are yet other considerations. A lighter plane will take off in a shorter distance, climb faster, and cruise faster (I see a 5-10 knot difference in cruise speed between just me on board lightly loaded, and wallowing along at maximum gross weight). It costs time and money to tanker extra fuel along, and could also be a safety issue on a short runway, if there are trees looming at the other end. As with the summer flying weather dilemma, there’s no automatic right answer for this: that’s why you’re pilot-in-command — you have to think hard, and trade off one kind of safety or efficiency for another, hoping you’ve found the best balance. Airline pilots worry about this even more than small-plane pilots do: someone once pointed out to me that for a 747, every takeoff is a short-field takeoff. This week, I got my whole family to Toronto and back safely, IFR both ways, landing with about 1:30 left in the tanks. It was nerve-wracking having to do such careful fuel management, and telling Porter FBO in Toronto the exact number of litres to put in each tank (rather than “fill ‘er up”), but it worked. My fuel burn was exactly as planned, we flew a bit faster for being light, and we got four adults back and forth in a 160 hp airplane. Next week, it’s just me and the my 12-year-old Border Collie flying to the Soo. I’ve filled the tanks right up to the brim, and will fly the whole thing non-stop for four hours, IFR or VFR, while the old girl naps in the back seat. This entry was posted in General and tagged aviating, tips. Bookmark the permalink. I have an ironic version of this problem. My airplane has a huge full-fuel payload and good CG range, so carrying the entire family (even in their adult future girth) is not a problem. Therefore, I have become a bit complacent about careful calculations of this or that, knowing that the plane will safely take it. However, once in a long while, a larger load appears – whether an extra adult, or an unusual quantity of cargo. I have to remember to whip out the rusty W&B calculator from its dusty corner and check things. I may have forgotten once or twice. Just one question: In your chart you have two rows: 20, and 24 gals. Is your fuel measuring device accurate enough to detect 2 gals of fuel in each tank? My experience with fuel measurement has always been using a dip stick. “3/4 tanks” or “1/2 tanks” is usually the measurement. Not “21 gallons”. So how do you accurately determine how much fuel is in each tank? Maybe this is a reason why my greatest fear with flying is fuel exhaustion. I haven’t had the luxury of using an accurate method of determining on board fuel quantity. Even with a calibrated dipstick, you’d only know with certainty the fuel amount at the start of the flight. If your fuel pressure / flow / level gauges are not precise & accurate to the same extent, concerns about fuel are quite rational. Unlike Frank, I fly a single-engine plane with a fixed-pitch prop, and have a much smaller range of altitudes, so I don’t have as many variables to control: at any given power setting, my fuel flow is very predictable. Unlike Blake, I’ve been flying the same plane for almost 8 years and 700 hours, so I know it pretty well. For the past few years, I’ve calculated my fuel burn after almost every flight (writing many of them in the journey log), and I can normally predict it to within 0.2 gal/hour now. Blake: I use a calibrated dipstick from Aircraft Spruce — it’s proven surprisingly accurate.